These are King Salmon and Trout Fishing Reports from Lake Michigan near Holland, Saugatuck, Grand Haven, and Port Sheldon. Coho, Chinook, Steelhead, Brown Trout, and Lake Trout caught mainly trolling with downriggers, lead lines, copper wire, and dipsy divers. Please add your report by responding to the most recent report. Fish on! Friday night, I took out my friends visiting from Mexico. It was a great night to be out, except for all the flies. We fished from 6:30 - 9:45pm and ended 2 of 3, with a 7 lb Steelhead and a little king. We started out deep and fished the 180 - 210 area, and while we marked fish 40 to 100 down, we couldn't get any takers. We worked our way back in and took the steelhead 80 down in 85 fow on a Mag Lemonberry. The Steelhead put up a great fight for Efren and put on an aerial show for all of us. Just before finishing for the night, we took the little King on a green fly and dipsy, 170 back set on 1.5 in 80 FOW. While it wasn't big numbers, it was better than being skunked. I'm still a few fish short of a picnic (Marina Party on the 4th), so I'm planning another trip or 2 before then. 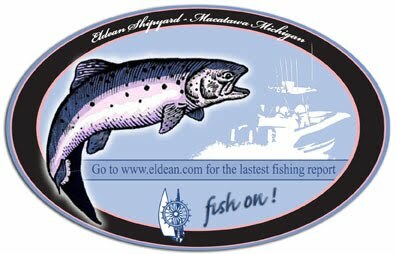 If you have a Salmon Fishing Report for Lake Michigan please click on the "Comments" link below. Fish On! Ryan and I took the boat to South Haven for the Weekend to stay and see a bunch of movies at the Waterfront Film Festival. The plan was to fish on the way down and on the way back. We fished Friday morning from 5:30 to 11. Things started off great as we were setting lines in 80 FOW off the Saugatuck channel. We got a nice king on a 4 color lead and bloody nose spoon as we were setting up the lines. Unfortunately this was the only action we had all morning as we fished all the way to South Haven in the 80 to 120 FOW range. Well, Mark and I gave it our best last night, but came up with a skunk. We had one nice fish on, but it spit the hook. Our only bite came 80 down in 130 FOW on a Wonderbread Magnum spoon. It was a little bouncy but we tried most directions and fished from 80 to 180, marking most fish in the 100 to 130 area. Sorry for the delay, but unfortunately I haven't had anything great to report. Over the past week I went out twice. The first was a dinner cruise fishing trip with Kris last Friday. We fished from 6-8pm and ended 1 for 3, mostly fishing in the 120 - 160 depth range. The nice 5 lb coho that we caught came in 65 FOW on our way in - We basically made one large circle to the North after leaving the channel. For a Friday night, it was remarkably quiet on the water with only a boat or two out there. The 2nd trip was Wednesday night. Ryan and I fished mostly in the 120 to 140 FOW and marked a lot of fish 40 to 80 feet down, but we couldn't get anything to go. We ended the night going 1 for 1 and bringing in a 7 lb king on a 12 color Lead, with a black spoon with green and white. Hopefully another trip this weekend. The Lake has been pretty flat so its been fishing friendly for most any boat and anyone!